The past two years I have made it a goal to read a biography on Jonathan Edwards. I’ve been stuck on the same one for those two years! Jonathan Edwards: A New Biography by Iain H. Murray has been such a blessing to read. Although I’ve taken my time reading it there have been some great parts that I long to instill in my own life. Right now, I do not have children. But, there are many letters that Murray includes in his biography of Edwards that the American Puritan wrote to his own children that inspire me to be a better father one day! It is amazing to see the love Edwards had for his own children and the concern he had for their eternal souls. 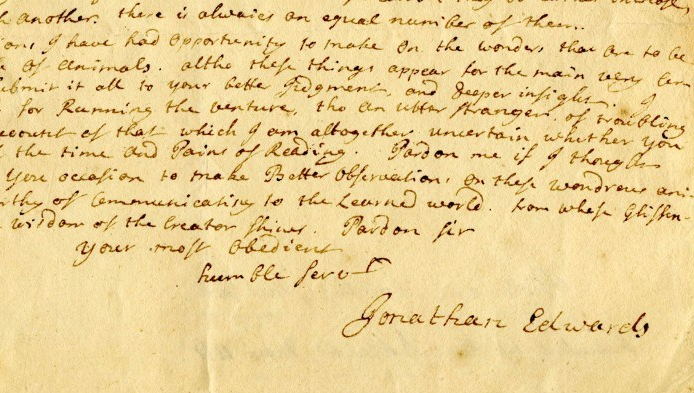 One such letter, written to his son Jonathan Jr., demonstrated how much he cared for his own children. At this time in his life, Jonathan Edwards had been fired from his church in Northampton and soon after became a sort of missionary to a group of Native Americans in Stockbridge. After a couple of years in Stockbridge, Edwards’ son, Jonathan Edwards Jr., went on his own missionary trip some 200 miles away from his father to another tribe of Natives. Jonathan Jr. was only 9 years-old at the time, but his father sent him away with the intent that he learned the Mohawk language, which he did and was told by the Mohawk people that he spoke it fluently (a language most English-speaking men could never master perfectly). While Jr. was away, his father sent him a letter. He was unsure whether or not the letter would reach him, but it did! I find the words of Edwards to his son to be quite loving and caring. I only hope I can care for my future children in this way. Though you are a great way off from us, yet you are not out of our minds: I am full of concern for you, often think of you, and often pray for you. Though you are at so great a distance from us, and from all your relations, yet this is a comfort to us, that the same God that is here is also at Onohoquaha and that though you are out of our sight, and out of our reach, you are always in God’s hands, who is infinitely gracious; and we can go to Him, and commit you to His care and mercy. Take heed that you don’t forget or neglect Him. Always set God before your eyes, and live in His fear, and seek Him every day with all diligence: for He, and He only can make you happy or miserable, as He pleases; and your life and health, and the eternal salvation of your soul and your all in this life and that which is to come depends on His will and pleasure. The week before last, on Thursday, David died; whom you knew and used to play with, and who used to live at our house. His soul is gone into the eternal world. Whether he was prepared for death, we don’t know. This is a loud call of God to you to prepare for death. You see that they that are young die, as well as those that are old; David was not very much older than you. Remember what Christ said, that you must be born again, or you never can see the Kingdom of God. Never give your self any rest unless you have good evidence that you are converted and become a new creature. We hope that God will preserve your life and health, and return you to Stockbridge again in safety; but always remember that life is uncertain; you know not how soon you must die, and therefore had need to be always ready. We have very lately heard from your brothers and sisters at Northampton and at Newark, that they are well. Your aged grandfather and grandmother, when I was at Windsor gave their love to you. We here all do the same.